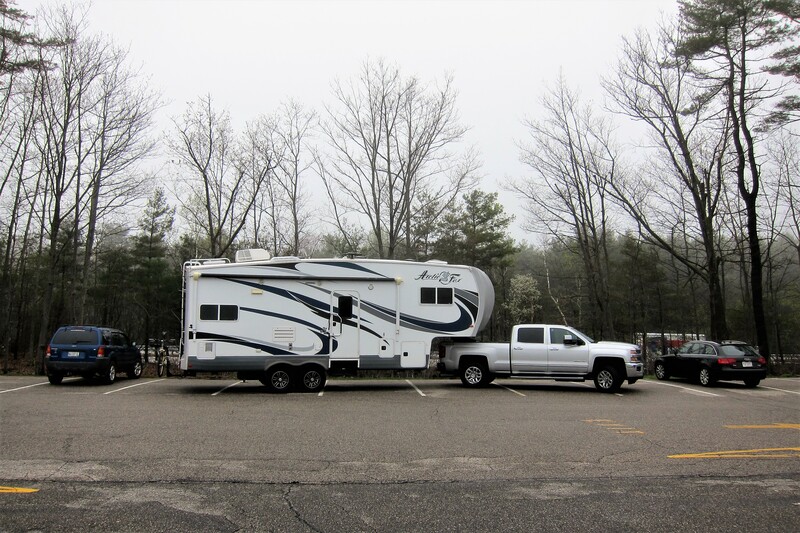 Monday, May 1, 2017: Woke following a restful night of Blacktop Boondocking at The Wal*Mart in Peoria, Illinois. Pulled out at 0730 under partly sunny (yep you read that right!) 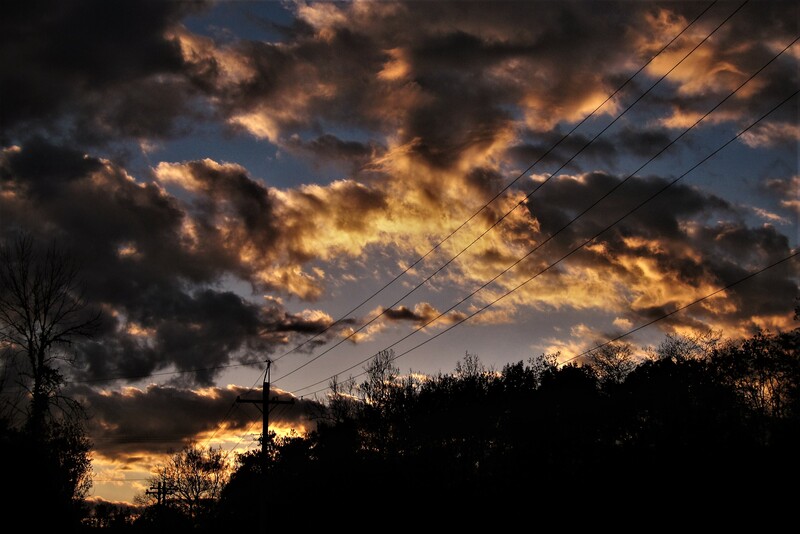 skies with a temperature of 48 degrees. Found Interstate-74 heading east and motored along enjoying the brief interlude from crummy weather. After stopping for fuel and breakfast at a Flying J Truck Stop we continued to make tracks toward the east coast. 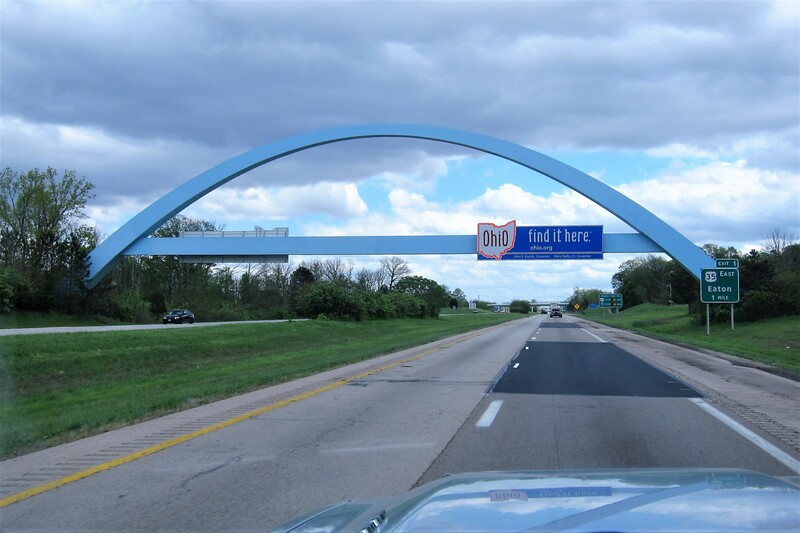 Around 1300, we merged onto Interstate-70 and continued East reaching the Ohio state border at 1405, where another pitstop was necessary. Even though there were periods where the skies looked like they would dump rain on us, it stayed relatively dry throughout the day…a bit gloomy but 100% better than the past few days! 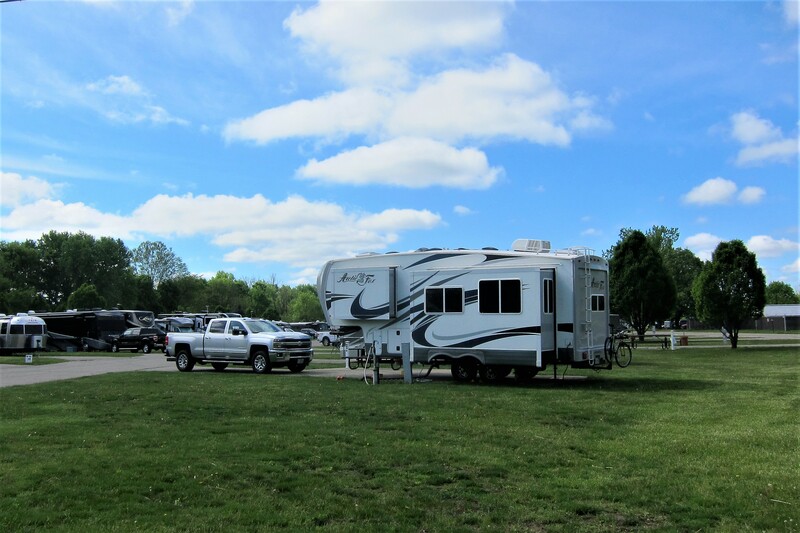 Shortly after 1500 hours, as the temperatures rose into the upper 60’s, we pulled the rig into Wright Patterson Air Force Base and found a nice site in their Bass Lake RV park. After setting up camp for a few days stay, then partaking in a nice camper cooked meal, Kit and I enjoyed the prospect of being off the road for a spell while the setting sun painted the western sky. Tuesday, May 2 and Wednesday, May 3, 2017-Wright Patterson AFB, Dayton, Ohio: This particular town has been a bucket list item of mine for some time, however it never worked out…until now! 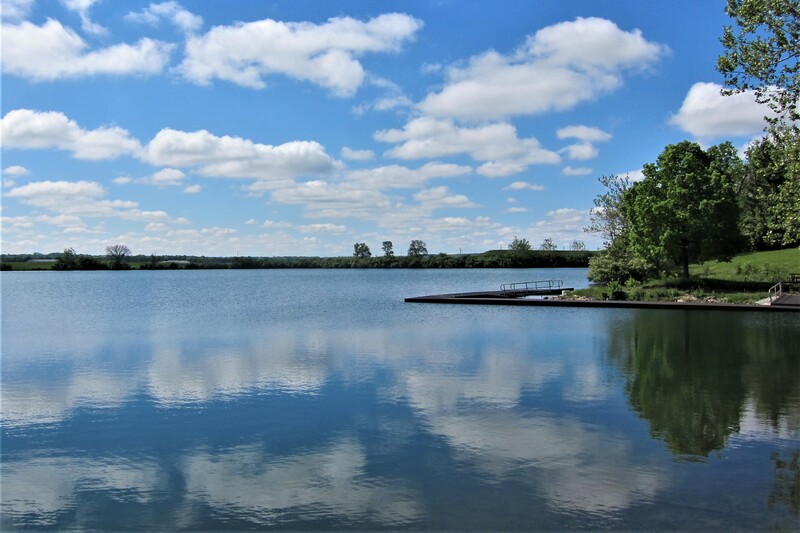 So, what is so special about Dayton, Ohio? Well to begin with it was the home of the Wright Brothers and their bicycle shop/aircraft manufacturing facility. And it is also home to the National Museum of the US Air Force. The museum contains over 360 aircraft within its sprawling 1,000,000 square feet of indoor exhibit space! 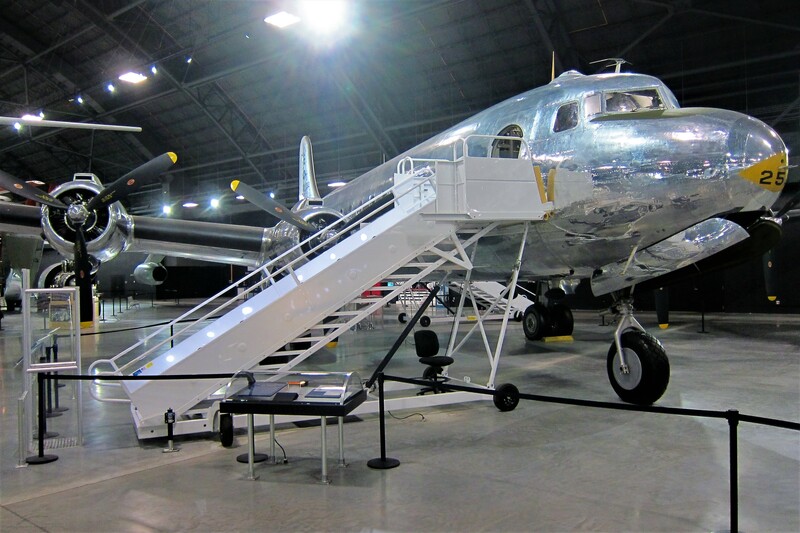 Many historic planes are on display and a number of one-of-a-kind prototypes are in residence as well. In addition, the museum features thousands of USAF artifacts. 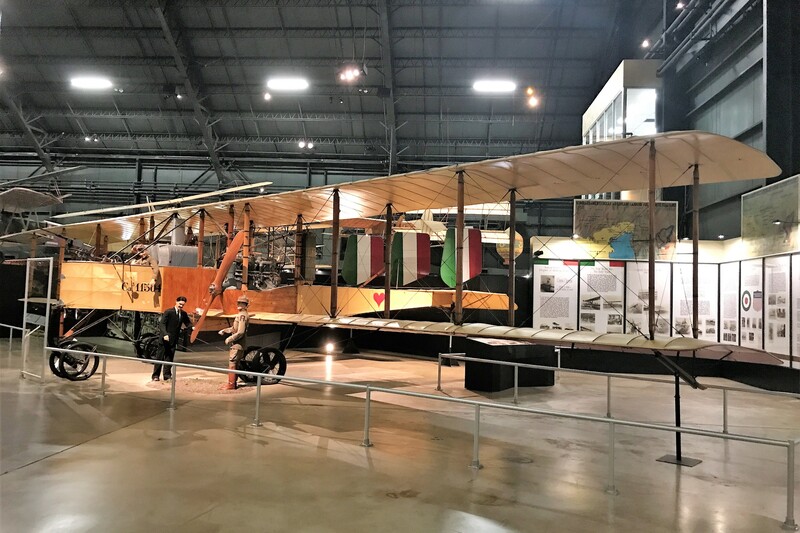 The exhibits are housed in four large interconnected buildings separated by era so the visitor can view planes from the earliest days of flight through the most modern aircraft and space vehicles. With so many airplanes, it was hard to pick ones to profile in this journal. So, since we’ve visited many other military museums where fighter aircraft are the main focus I decided to profile the US Air Forces stock in trade…the mighty bombers. And, then add a few of the more interesting or unusual experimental aircraft. The first building contained artifacts from WWI, such as this early bomber. The Caproni CA-36 is an Italian designed, Fiat powered, heavy bomber capable of 87 MPH speeds up to an altitude of 14,765 feet while carrying 1,764 pounds of bombs. Next is a WWII vintage B-29 Superfortress heavy bomber capable of speeds to 357 MPH at a maximum altitude of 33,600 feet, while carrying 20,000 pounds of bombs. This particular aircraft, nicknamed “Bockscar” after the aircraft commander Captain Bock, performed a significant role in August 1945 when it dropped the world’s second, and hopefully last, nuclear bomb on the Japanese city of Nagasaki, which is now credited for convincing the Japanese to surrender and bringing the end of World War II in the Pacific. 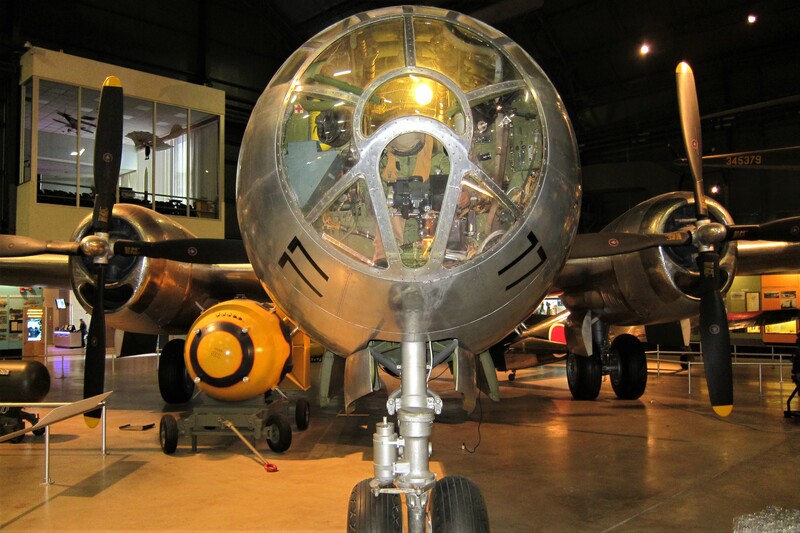 Following the war, B-29’s were used for other research and other missions, such as a launch plane for the experimental Bell X-1B. 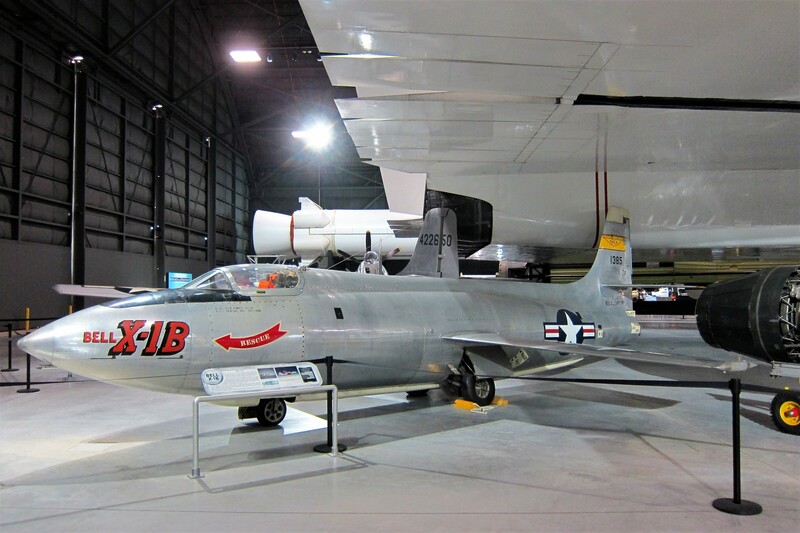 The X-1B was a purpose-built aircraft to test the feasibility of supersonic flight. Carried aloft by a mother ship, it was basically a manned rocket in that once the engine was ignited it flew at full power until the fuel was expended, which resulted in an average flight time of five minutes. Then the X-1B was guided to a landing under dead-stick conditions. Also on display was this 189-foot-long monster. The XB-70 Valkyrie, was constructed in the early 1960’s as a long range, high speed, high altitude bomber. The aircraft possessed six huge engines capable of propelling the giant plane to over 2,000 MPH and altitudes above 74,000 feet. 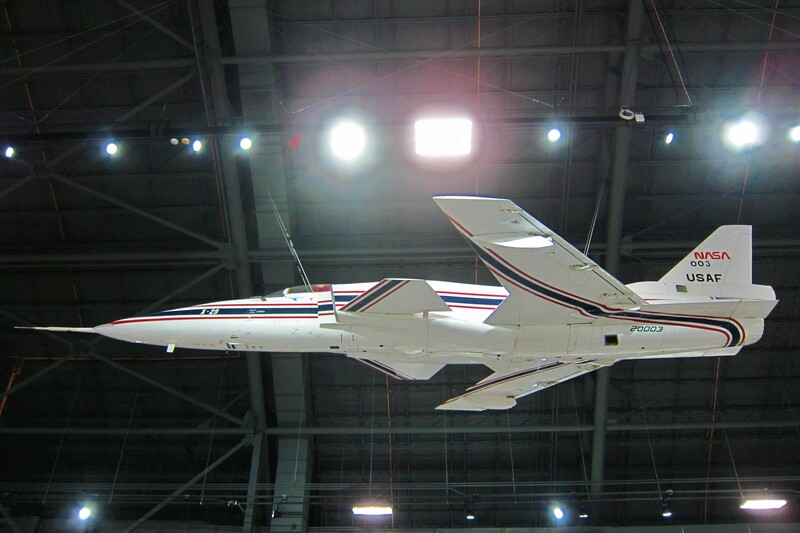 Around the time that the first XB-70 was being completed, its survivability was brought into question by advances in anti-aircraft missile capability. 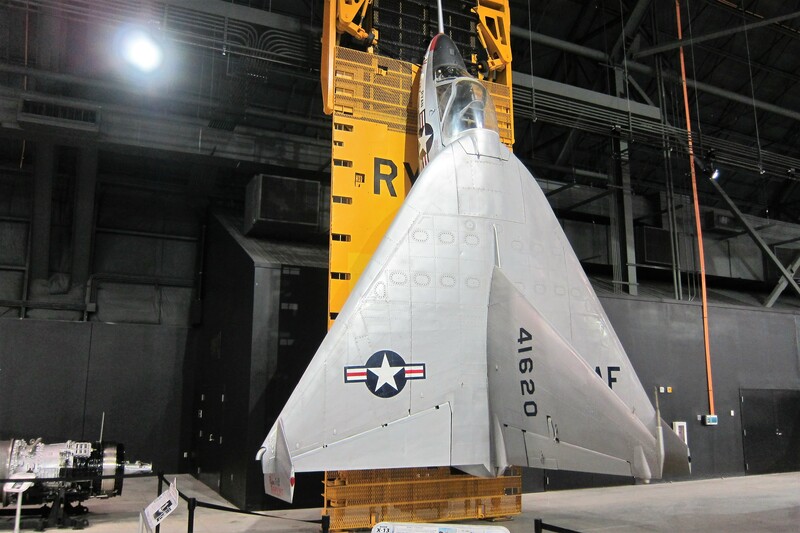 The programs death knell was America’s development of the Inter Continental Ballistic Missile which rendered the XB-70 unneeded, so the program was cancelled…the XB-70 then became a very large, and very expensive, museum artifact. And then there is this sinister looking aircraft. The B-2 Spirit stealth bomber can fly up to 50,000 feet at a maximum speed of 630 MPH while carrying up to 50,000 pounds of ordnance. A flying wing design, the bomber is inherently unstable without computer controlled flight assistance. Since all B-2’s are in operational inventory, this display is a retired engineering mule from the manufacturer, Northrup Grumman. 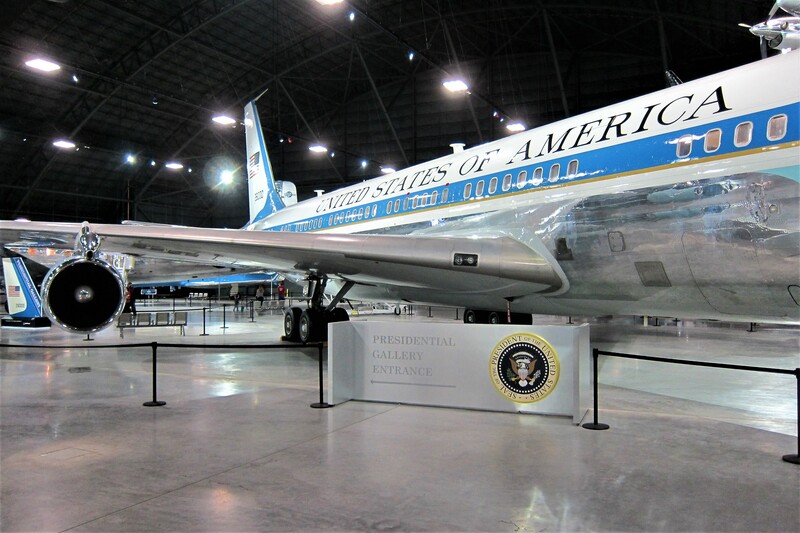 Also in the museum collection are a number of historic aircraft that have carried the US President as Air Force One. 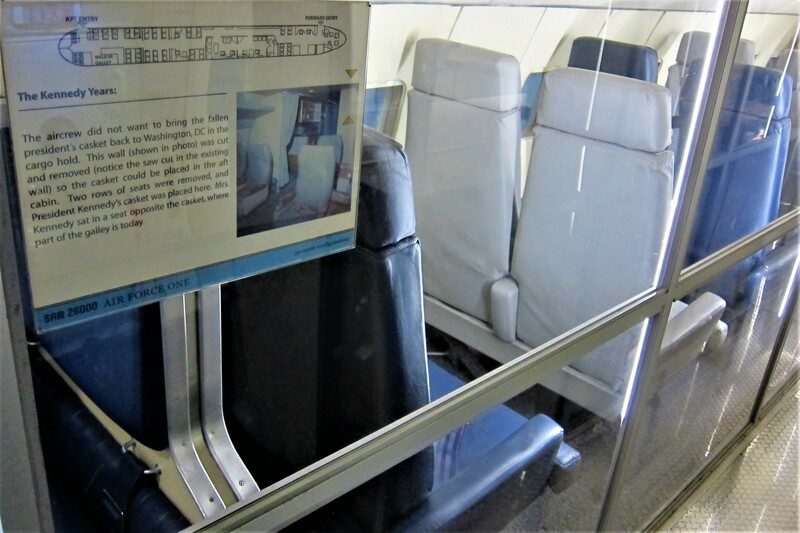 The first is a highly modified Boing-707 which served eight presidents, including John F. Kennedy on that fateful trip to Dallas in November of 1963. One of the most poignant spaces on this plane is the area that carried the slain president back to Washington. Since no one wanted the fallen president’s casket to ride in the baggage compartment, several seats were removed as well as the aft bulkhead in order for the casket to ride in the main cabin alongside Mrs. Kennedy who was accompanied by newly sworn in President Johnson. Another interesting retired presidential plane is a VC-54 Skymaster, the first aircraft specifically built to carry the US President. 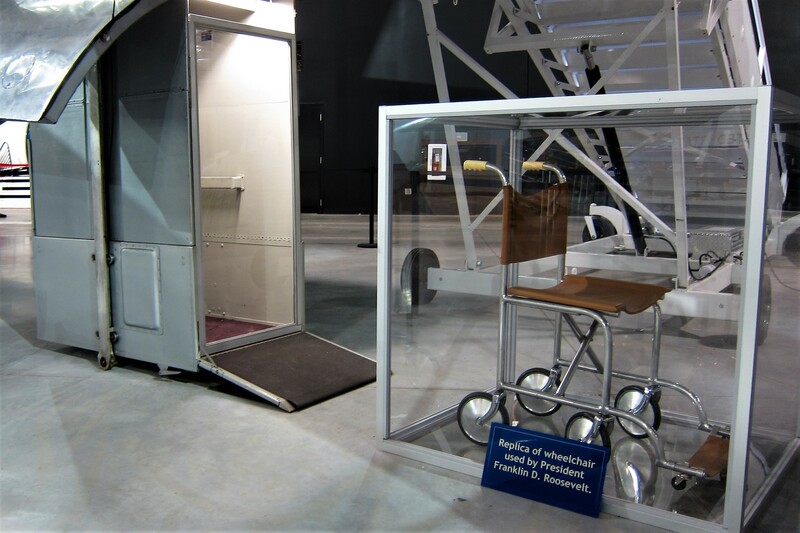 During his term, Franklin D. Roosevelt used “The Flying White House” which was built with a special elevator to allow the disabled president to access the plane while seated in his wheelchair. President Roosevelt was the first Commander in Chief to have a military aircraft at his disposal, but, following his untimely demise, the plane went on the serve President Truman as well. 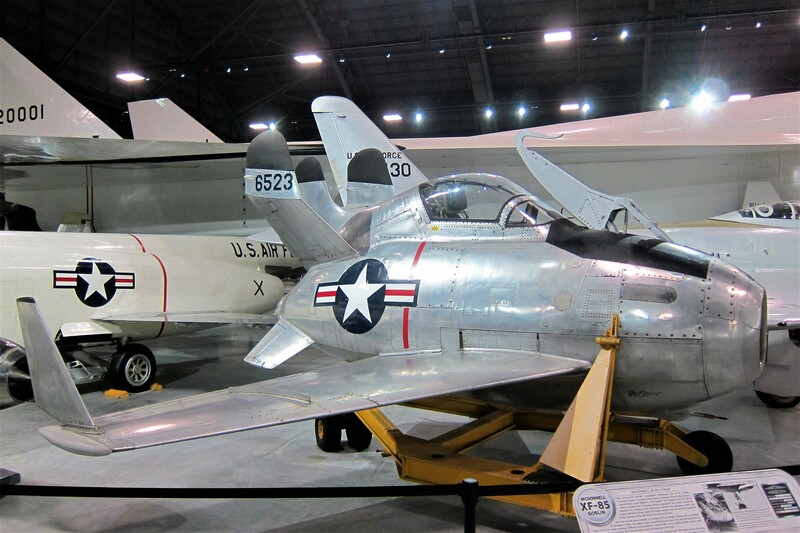 There are a number of very rare and unique flying craft in the museum as well…such as this XF-85 Goblin built in 1945. Designed to be carried in the bomb-bay of a heavy bomber, the Goblin, known as a “parasite fighter”, was designed to be lowered on a trapeze, fired up and released, then fly to engage nearby enemy fighters. Difficult to launch and almost impossible to retrieve, the lightly armed Goblin would have been in mortal peril…especially considering it had no landing gear. There were only two XF-85’s built and neither were ever used for their intended purpose, although a few test flights were attempted with minimal success. 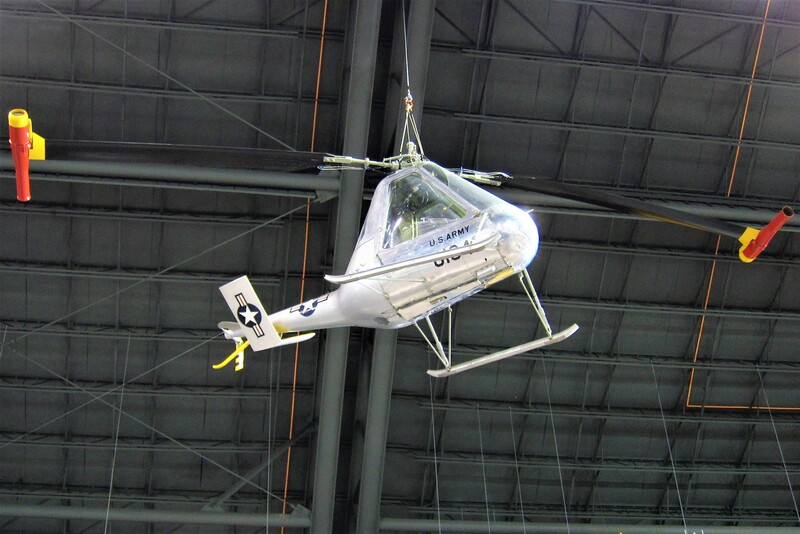 An experimental helicopter hanging from the ceiling was unique in that it did not have an engine! Rather it possessed two pulsejets mounted on the tip of the rotors. Built for the US Army as an “aerial jeep”, the XH-26 was surprisingly successful, but incredibly loud…which doomed its usefulness. 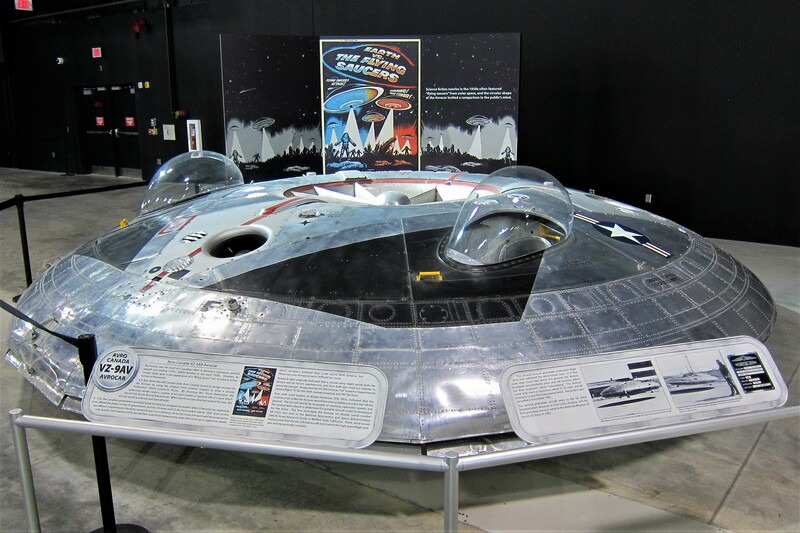 On the subject of useless aircraft, there is this flying saucer designed by the Canadians and built by the US Air Force in 1958. 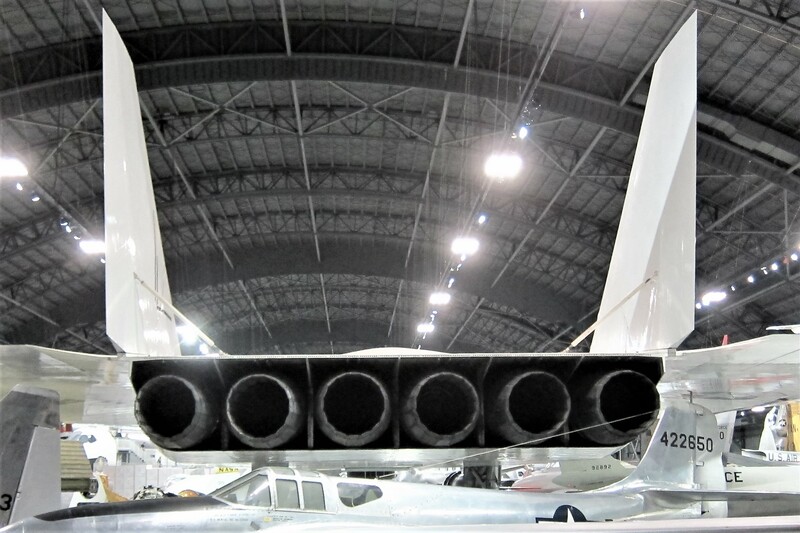 The VZ-9 Avrocar was supposed to lift off vertically using its large Turbojet engine then transition to horizonal flight by vectoring the exhaust rearward to attain supersonic speed. Its hovering stability was problematic, then when the contraption did move horizontally it was very unstable reaching a blazing speed of 35 MPH… the program was cancelled after one harrowing test flight. A strangely configured experimental plane that did show some promise was this X-13 Vertijet. The aircraft could launch vertically, pitch over to normal flight and when ready to land, transition back to vertical while slowly descending to its ground fixture where it would snag a landing hook. The concept worked, but it took a very skilled pilot to successfully land the thing…that and cost overruns doomed the project to this single plane. Another experimental plane that was used as a design and engineering mule was the X-29. Built in the 1980’s to test the “forward-swept wing” configuration, as well as a number of other state of the art concepts, the X-29 reached supersonic speeds while testing flight dynamics. Later in the decade, it retired to the museum after successfully completing the test program. Many of its technical concepts have migrated to military aircraft currently in production. 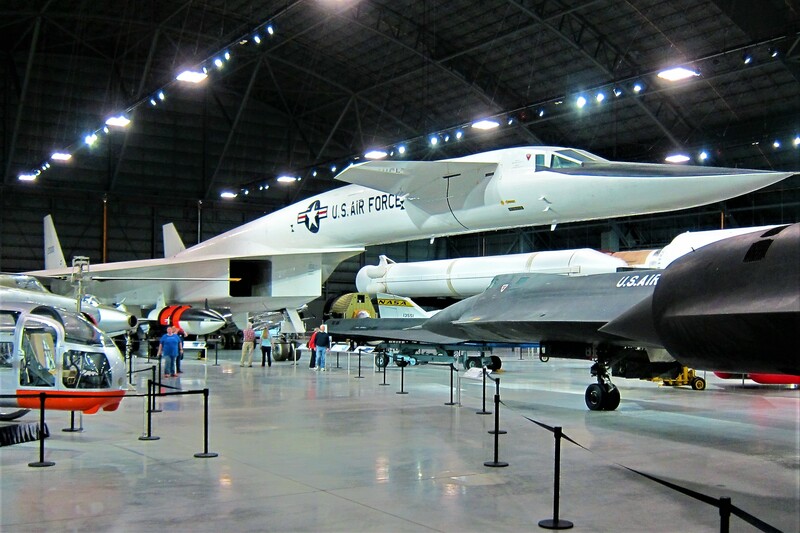 The National Museum of the US Air Force, is a very popular tourist attraction…many tour and school groups visit the facility throughout the year. 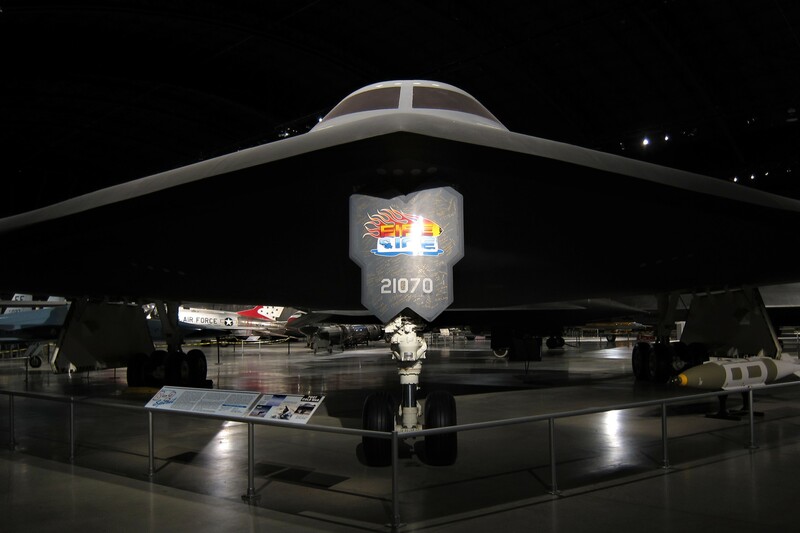 It is bordered by Wright Patterson Air Force Base but has its own public entrance and admission is free. 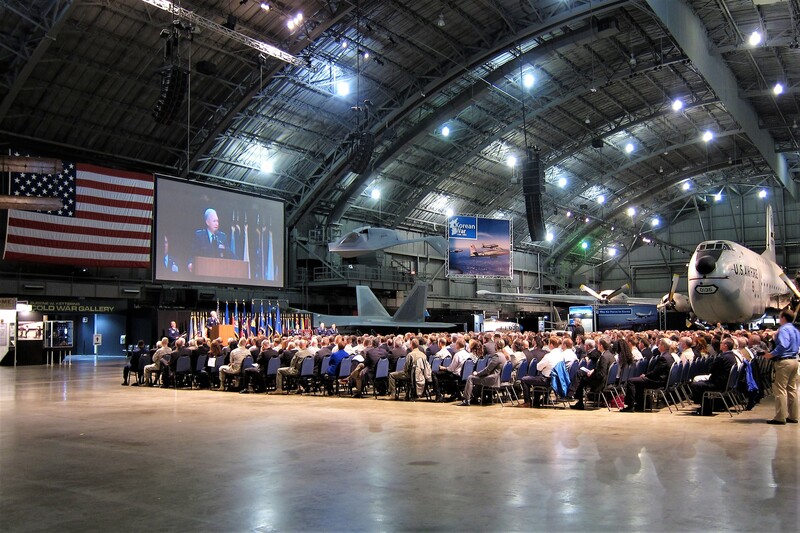 According to one of the docents, many military related groups use the museum for ceremonial functions…such as this promotion, and change of command, for a couple of USAF Generals that I stumbled upon. While loitering about the periphery and observing for a bit, I remembered the many “mandatory invitations” I had received while on active duty…standing at attention while grumbling at the loss of work or play time. This assemblage of America’s best honoring the accomplishments of their brethren seemed more relevant. Maybe I’ve developed a change in attitude over the years. 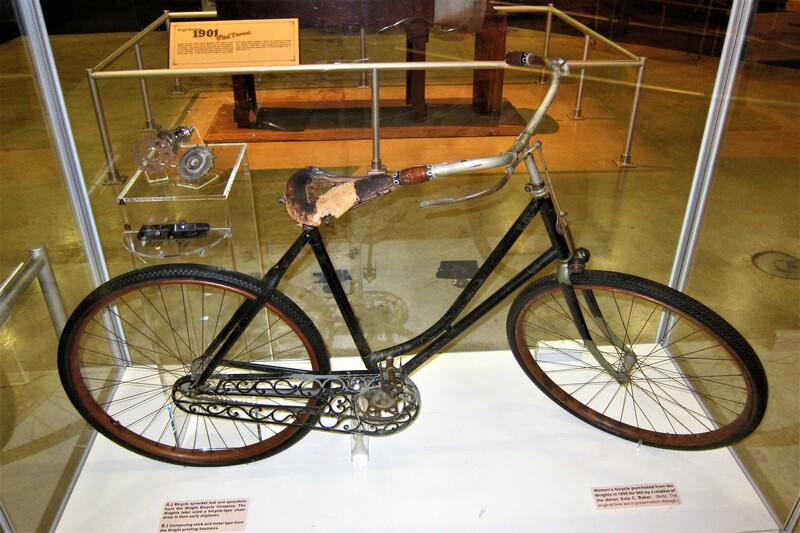 Since the US Air Force Museum possesses examples of America’s most important and iconic aircraft, it seemed fitting that one of the first artifacts to confront the visitor is the lowly bicycle. This bike is an original built by Orville and Wilbur Wright in the late 1890’s. The brothers, possessing only High School Diploma’s, designed and sold bicycles at their shop in nearby Dayton, Ohio…which gave them experience, confidence and the resources to build and fly the first practical aircraft. Helping to prove that an advanced education is not always needed to be successful in life! 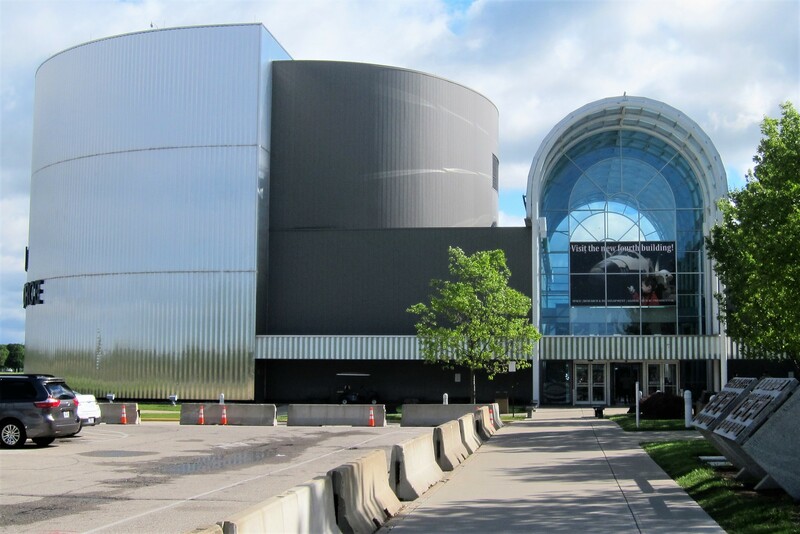 A great day at a great museum…if anywhere near Dayton, Ohio, be sure to visit! Back at the campground, Kit and I spent time relaxing about the beautiful grounds. 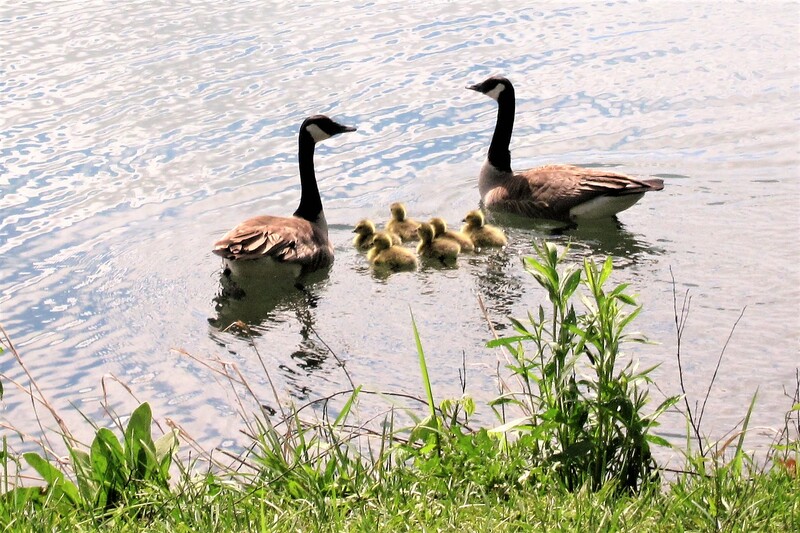 And watching a family of geese, including the seven little yellow fur balls, paddling about the placid pond. A very pleasant and entertaining stay in west-central Ohio…but, tomorrow we must trundle on toward the east. 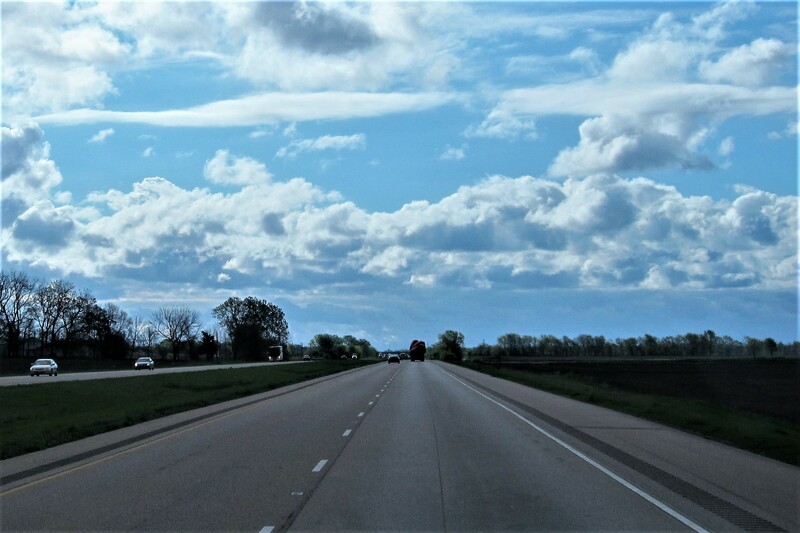 Thursday, May 4, 2017: On the road at 1015, under cool and rainy skies. Kit and I have resigned ourselves to the fact that we will either be in a rain storm, or being chased by a rain storm, for the remainder of the trip. Looking at the long-range forecast there are continuing lines of thunderstorms marching across the continent…oh, well. Jumping back on I-70 we make tracks toward the right coast. Originally, we thought we would drive up to Cleveland and visit the Rock and Roll Hall of Fame, a bucket list destination. 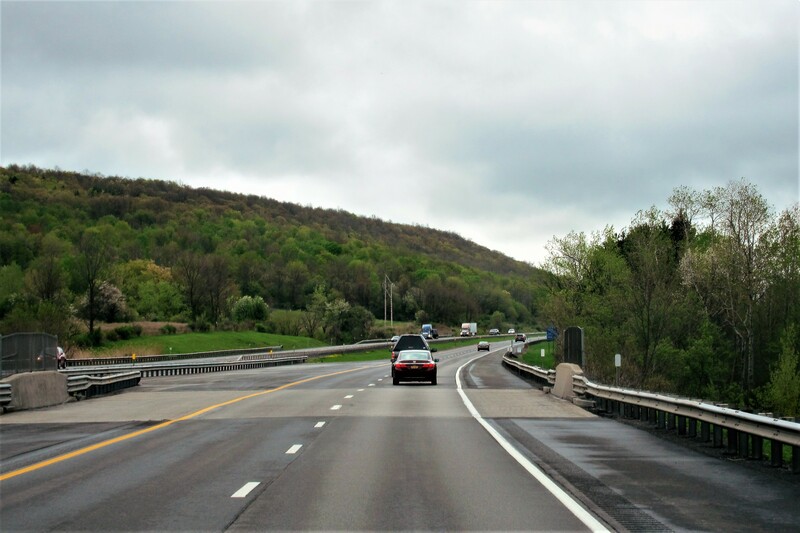 However, with the relentless rain, cool temperatures and a desire to just get home, we diverted to Interstate-76 and motored along until reaching I-90 and then headed eastward. 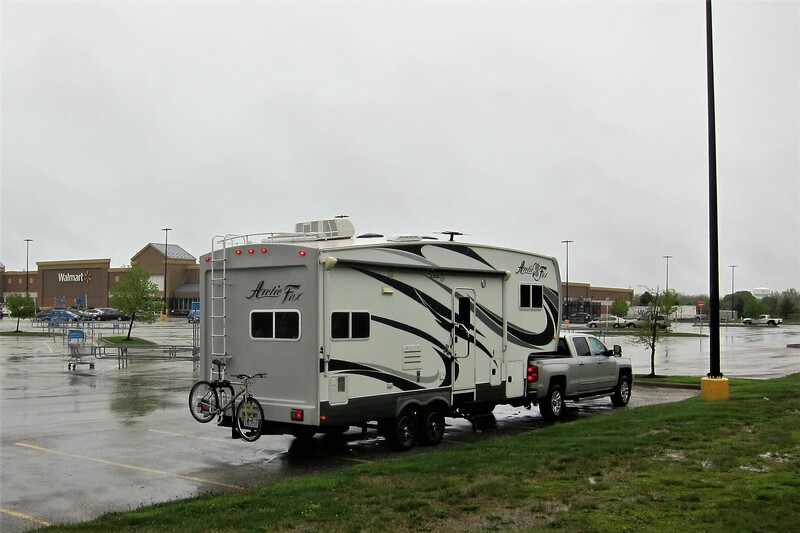 Shortly after crossing the Pennsylvania border both Kit and I were growing a bit weary, so a quick look on All Stays provided a recommendation for an overnight stay on a rain soaked parking lot at The Wal*Mart in Harbor Creek, PA. Positioning the rig on the outskirts of the large parking lot near an overhead light we settled in for the evening. Friday, May 5, 2017: Hey, guess what? It’s raining! Kit and I enjoyed a quiet and very restful night aided by the relentless mesmerizing rain on the camper roof and very little traffic motoring by. Noticing there was a Bob Evans Restaurant on the far side of the parking lot, we decided to treat ourselves to breakfast. Following a very nice meal, it was once again time to dodge the raindrops as we headed out on the highway, and yes, another full day of steady rain was endured as we drove east. You know, I think our forward speed is matching the overall speed of these rain systems. When Kit and I stop for the evening, the storm moves on, but another system will march in from the west to take its place just as morning breaks!?!? 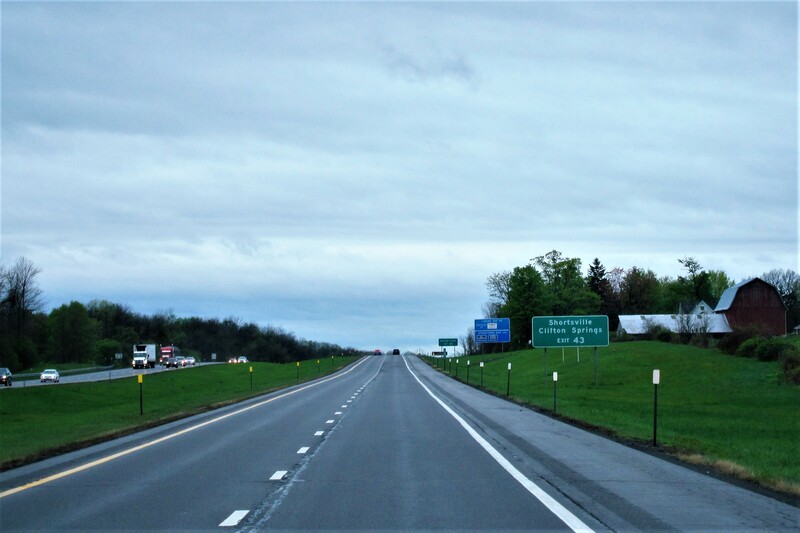 Within 30 minutes, we crossed into the state of New York and encounter the NY Thruway…the main east west artery in this part of the country. Expensive yes, but also convenient and a quick way to pile on mileage in the waning days of this year’s Excellent Adventure trip. Besides, the Turnpike Authority allows overnight parking at their Service Plaza’s…so at 1600 hours, that is where we landed for the night. As you can see, we have successfully outrun the latest rainstorm…but never fear, there is surely another in the wings. Saturday, May 6, 2017: Woke to rain, of course, and temperatures in the mid-50’s. After a quick breakfast in the travel plaza food court, we pulled out at 0930 and continued east on the NY Thruway. Shortly before noon found us crossing the Hudson River and a few minutes later entering the State of Massachusetts and merging onto the Mass Pike. 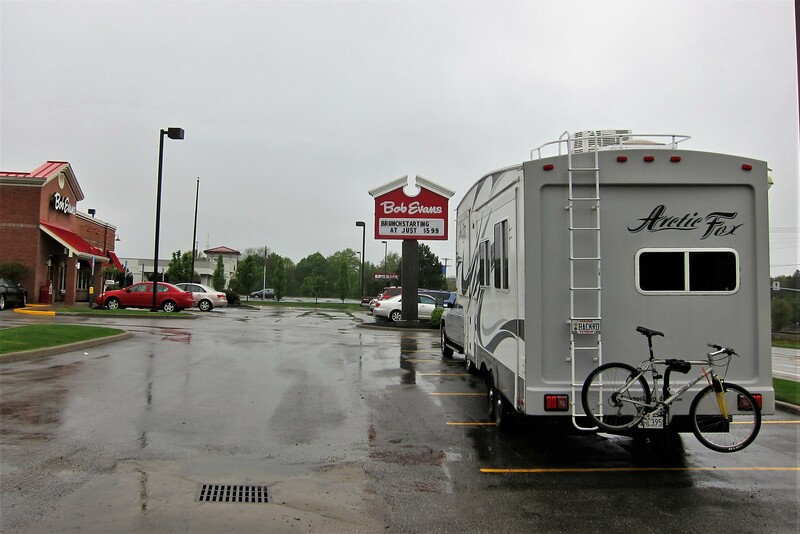 After stopping for lunch and fuel at a Turnpike Travel Plaza, we made good time heading east and crossed the New Hampshire border just as the rain began to subside. 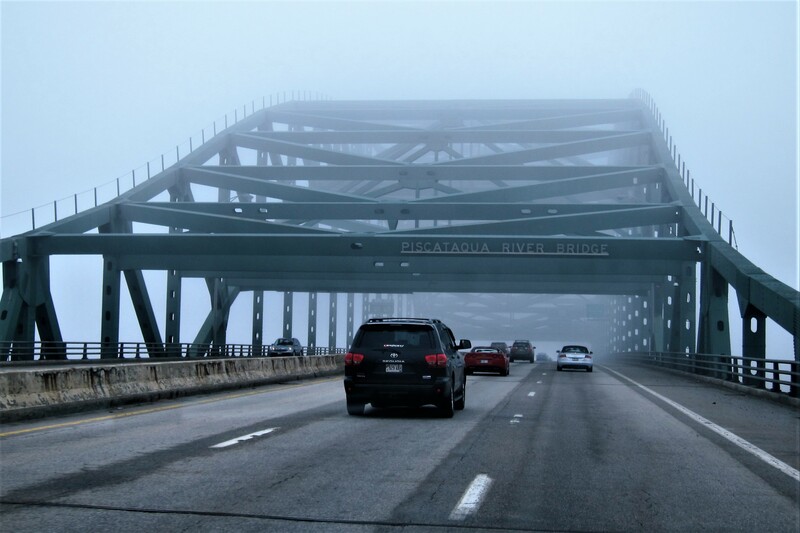 At 1600 hours, Kit and I motored over the Piscataqua River Bridge leading to our home state of Maine! Yep, the rain has been supplanted by…fog!?!?!?!? It’s great to be back in Coastal Maine…now, where is the spring weather?! As has become tradition when returning from these trips, Kit and I made a stop at Kittery Trading Post (KTP), a premier Maine Outdoor Outfitter. 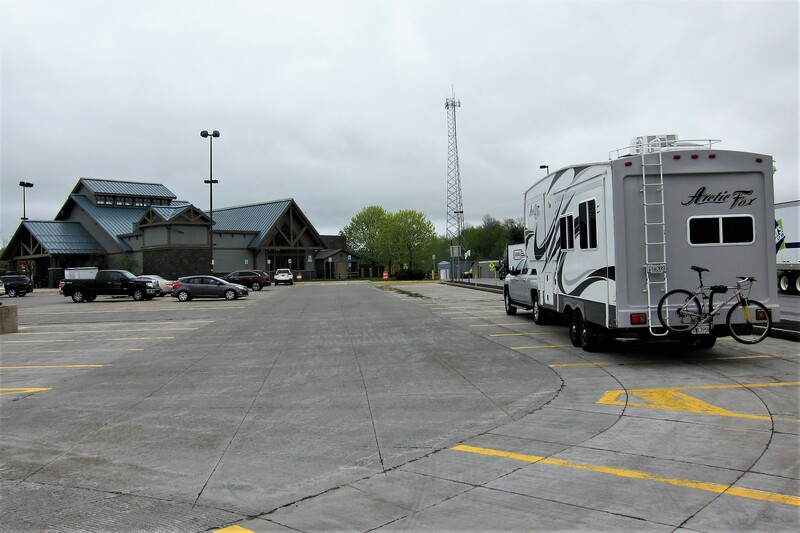 KTP has plenty of parking, a great place to stretch our legs while looking for that must have gear, and it is close to our first opportunity for some Maine seafood. We like to park on the perimeter of their lot, which we did this day. However, being a weekend, the availability of suitable spots was slim, so I squeezed the camper between cars to make it all work…another good reason for a relatively short rig. 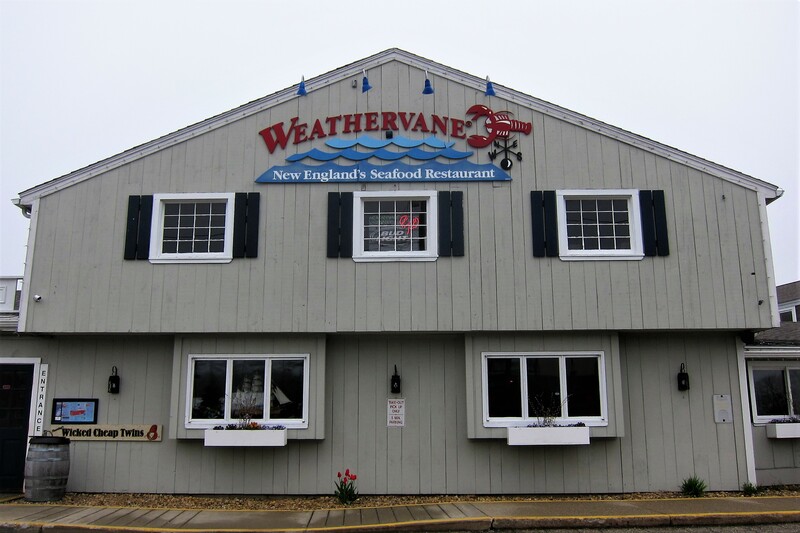 Following an hour of stretching our legs and browsing the merchandise, Kit and I walked across the street to The Weathervane Restaurant. 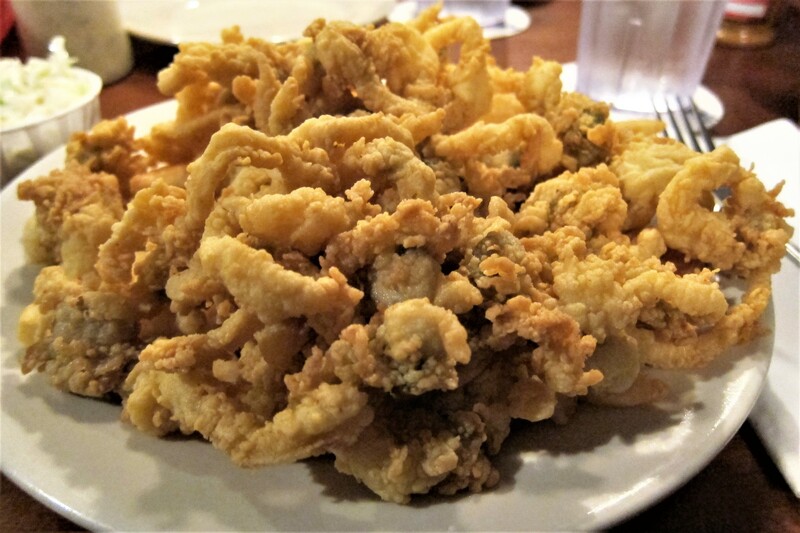 Where the indulgence of the day was a heaping plate of fried Maine Clams! And some delightful chatter with the waitress, who was amazed we had driven from California just to visit her establishment! Back on the road and heading north on I-95, Kit and I spent the next hour and a half discussing the highlights of this year’s trip, and decided that we are indeed blessed. 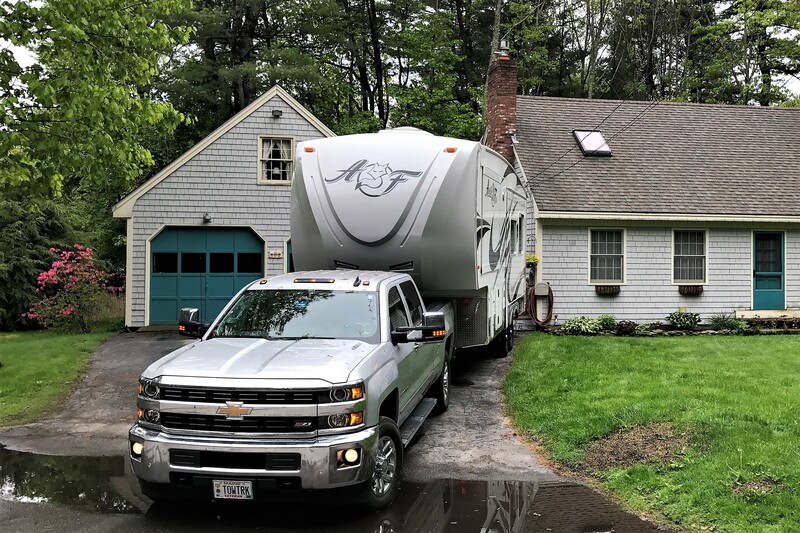 Our life on the road for six months’ is very enjoyable, and our life in Maine for the remainder of the year, is equally as enjoyable…the perfect combination for us. Pulling into the dooryard shortly before 2000, and backing the camper into the driveway, Kit and I returned to family, friends and all our stuff pretty much as we left them back in November. Kit’s Bit’s: Yes, it’s GREAT to be home! Even though we have frequent communications with our kids and grandkids, it’s just nice to see them in person! We always have quite a bit of catching up to do and this year was special because Joe, our son, turned 50 on May 15th and we wanted to be home for that. Since Mother’s Day fell on the 14th, as it did the year Joe was born, we had a nice family gathering and surprised Joe with his favorite German Chocolate cake to celebrate! It was a very nice family gathering and wished Suzie, Kevin, Jack & Tucker could have been there. Thanks Katie, for helping me plan everything! Love you! Happy to have everyone along for the ride…see you next year! QUITE THE MUSEUM, NOW I UNDERSTAND BETTER WHERE ALL OUR TAXPAYER MONIES HAVE GONE OVER THE YEARS. STILL A GREAT INVESTMENT IN OUR SAFETY AS WELL AS OUR ALLIES. I SUSPECT THAT THE NEXT CONFLICT WILL BE FOUGHT MORE FROM SPACE THAN ON LAND!! GOD BLESS OUR TROOPS AND THE US OF A.
I’M PROUD TO HAVE SERVED DURING THE KOREAN CONFLICT AND WOULD GO BACK IN TOMORRA. If JEANNE WILL LET ME!!! Hi folks: Good to know you are safe and sound in Maine once more. Yes, we well know the excitement of wind, rain, hail, snowstorms when traveling home! We caught it all this past April. We wish you both good health, and a wonderful summer in Maine. Wish we could join you!! Sterlin once had a temperature sensitive coffee mug with a B-2 Spirit stealth bomber on it that disappeared when it contained hot coffee. We’ll tell you the story sometime. Se you in about 10 days. The final journal for this trip! 😦 I’ve thoroughly enjoyed each and every one and looking forward to your next adventure! Thank you so much for sharing so much ….it’s been incredible… The Nat’l Museum of the USAF does sound like a bucket list item. A million square feet!??? Like a little community… If those planes could talk..especially the “Bockscar” and the plane that carried JFK on his final trip after assassination! That one in particular gave me chills..a flying history book! I’m so glad you two made it home safely and was able to get some great Maine seafood once again… I loved your trip’s statistics also…very interesting. WELCOME HOME!!! !